Drawing from their vast experience in making classical music available, Mssrs. Henley and Jackson have crafted a thoroughly enjoyable work that is of value both to the newcomer to classical music as well as the more seasoned aficionado. They approach the subject with both a love of music and a strong awareness of the reluctance many people have to become involved with this musical form. The book is divided into three main sections. The firsts section deals with the language of classical music, concert etiquette, and how to build your own music collection. The second section provides an overview of the different periods of classical music from around 1000 ACE to the 21st century. Each period has several major composers and their music described. The third section is a compendium of facts and charts covering a variety of facts and figures about classical music. The authors are to be commended for omitting all musical scores from the book. Publishing a musical excerpt would only intimidate the novice and not add appreciably to the enjoyment of other readers. Those knowledgeable enough to read the musical scores would not benefit much from this book, although they certainly would enjoy it. The rest of us can learn a great deal without having to confront a score that means little to us. Capsule summaries of great composers give insights into the personal lives as well as the music. The net effect is to make these musicians human and less formidable, a worthy result. The background notes to the different compositions make the music much more enjoyable to listen to and understand. There are many tables of useful information to help with knowing more about composers and their work. The “Classic FM Hall of Fame Top 300” provides an excellent introduction to more well known compositions and gives the new listener a solid foundation for selecting classical music. Helpful information is provided on how to build your own classical music collection. In another chapter, quotes from composers about other composers show the lack of awe in which they held each other. The remarks are quite cutting, but delightfully so. 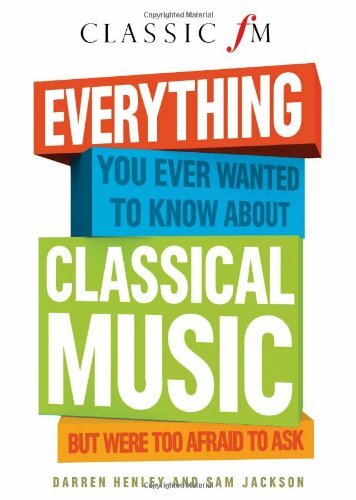 Everything You Ever Wanted to Know About Classical Music is a relaxed, informative, and eminently enjoyable introduction to the field of classical music.